The Temptation of Adam, by James Barry. Look grandfather, I am but a nymph! Lady Caroline Crichton and her grandpa? In 1992, Norton’s stand-up comedy drag act as a tea-towel clad Mother Teresa of Calcutta in the Edinburgh Festival Fringe made the press when Scottish Television’s religious affairs department mistakenly thought he represented the real Mother Teresa. This one by Paul Henry, A Connemara Village, is under some serious copyright I guess. 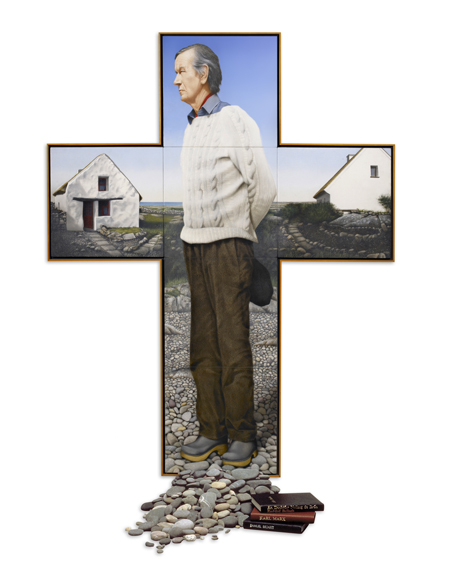 Robert Ballagh’s portrait of Neil Brown “communicates the resolute character for which he was known.” I’ll say! Copyright plus reproductions don’t do it justice. Worth seeing if you’re in Dublin. The Liffey Swim by Jack Yeats (W. B’s brother) won Ireland’s first Olympic medal, a silver in 1924 in the category Painting. (Jean Jacoby took gold). Good question — I haven’t run into this. I try to be careful not to use any pictures that couldn’t reasonably be considered public domain or fair to use, and I always try to link to the source where I got them.